Pretty Poison . . . Recently, while on a quest for Queen Anne’s Lace, one of the prettiest late season wildflowers to be found in urban waste places, I stumbled upon its attractive yet deadly Doppelganger: Poison Hemlock, Conium maculatum. This is the plant that literally killed the Greek philosopher Socrates. The concoction he was forced to drink after his Apologia in Athens was derived from this biennial native of Europe and North Africa. The active poison is an alkaloid related to nicotine called conine, which if ingested causes paralysis and, by extension, suffocation. 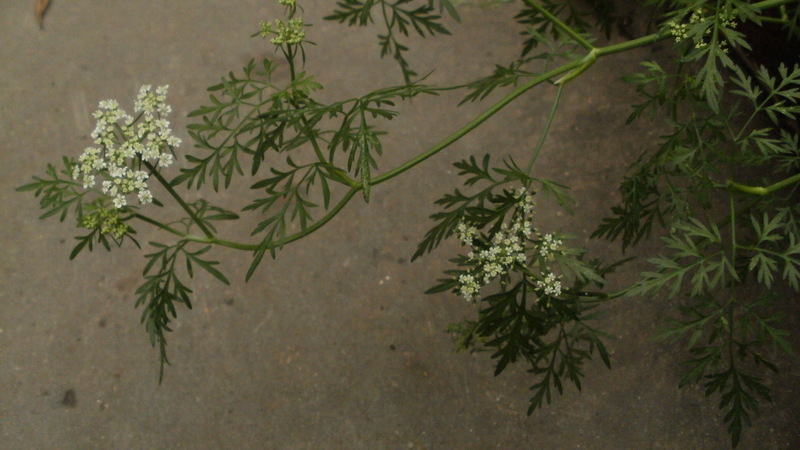 Poison Hemlock has a superficial appearance to the wild carrot, Queen Anne’s Lace, and to an unrelated flowering plant from the daisy family, Yarrow. 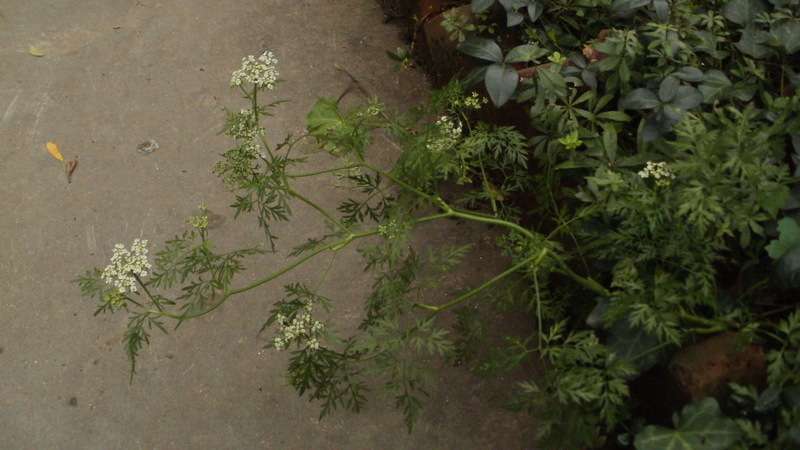 Both the Poison Hemlock and Queen’s Anne’s Lace are part of an expansive family, Apiaceae, which includes such familiar names as the orange cultivated carrot, anise, cumin, dill, fennel, parsnips, and parsley. Poison Hemlock, Queen Anne’s Lace, and Yarrow all possess compact white flower heads called umbels. The ones of Queen Anne’s Lace have been a popular subject of still life artists and most people have memories of seeing these sway along the roadsides and fallow fields of late summer and early autumn. Subtle differences that allow the easy identification of Hemlock are to be found in the details: Hemlock’s stems are long and smooth, while those of the Queen Anne’s Lace are hairy. Queen Anne’s Lace also has a heavier, more rounded umbel, often with a single infertile purple bloom at the center. As this umbel ages, it folds up and resembles a songbird’s nest. 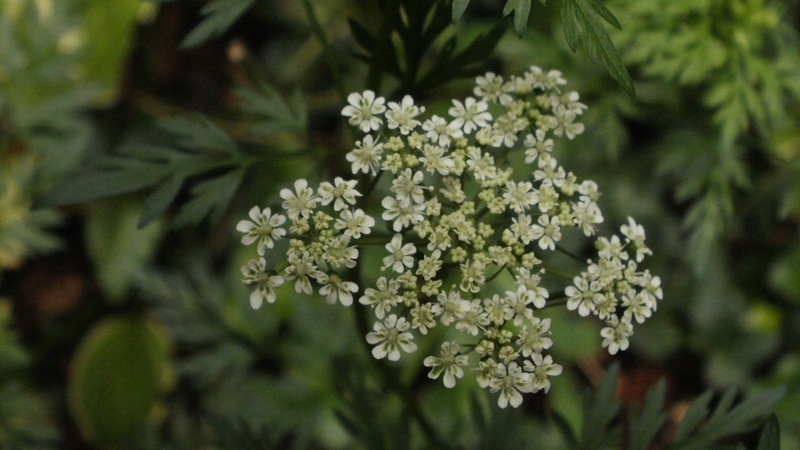 The Hemlock’s are smaller, irregular in shape, and uniformly flat and white. The individual flowers are tiny with pale green centers. The gardens surrounding the Church of Saint Luke in the Fields, located on Hudson Street between Christopher and Barrow, have become one of my favorite spots to spend a green hour within the West Village. I discovered onion grass growing there in April and, ever since, have been following the garden’s progress. An evolving series of cultivated plants has ranged from common holly and hydrangea shrubs to exotic blooming annuals. In early October, I was sitting on a bench, enjoying a café au lait, and watching English house sparrows scurrying in the leaf litter. A white patch in the background caught my eye. The plant to which it was attached was graceful, its glossy leaves lacy, with smooth stems projecting over the path, holding umbels like white knitted mittens, or perhaps nonpareil candies. Inviting to contemplate, yes, but I will make no apology: only savor this one with your eyes.